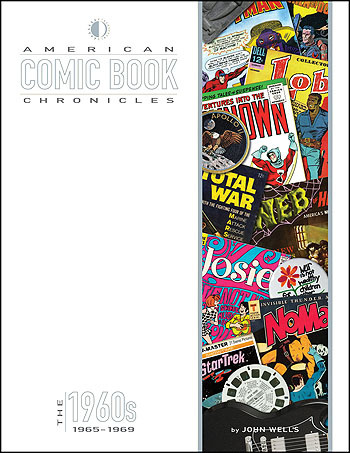 The American Comic Book Chronicles is our ambitious series of full-color hardcovers, where our top authors document each decade of comic book history from the 1940s to present. These books compile over 2000 pages of heavily-researched information, in a friendly, searchable year-by-year format. Taken together, the series forms a cohesive, linear overview of the entire landscape of comics history, sure to be an invaluable resource for any comic book enthusiast. Now shipping is John Wells’ new volume on 1965-69. It covers the transformation of Marvel Comics into a pop phenomenon, Wally Wood’s Tower Comics, Charlton’s Action Heroes, the Batman TV?show, Roy Thomas, Neal Adams, and Denny O’Neil leading a youth wave in comics, Gold Key digests, the Archies and Josie & the Pussycats, and more. CLICK HERE TO ORDER! And in August (debuting at Comic-Con) we’ll be releasing the 1970-79 volume. The next two years will bring a 1920s-30s volume, two 1940s books, and a 1990s edition to round out the 20th Century. It’s the culmination of what I started with TwoMorrows back in 1994. This entry was posted in TNT on 22 May 2014 by Mr. Morrow. Alter Ego #125 is now shipping! 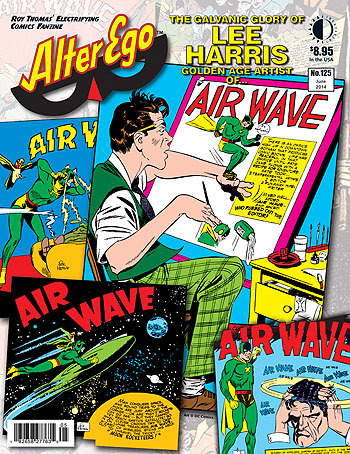 ALTER EGO #125 (84 pages with FULL COLOR, $8.95) telegraphs everything you ever wanted to know about LEE HARRIS—the artist/creator of the Golden Age Detective Comics super-hero Air Wave—as revealed by son JONATHAN LEVEY to interviewer RICHARD J. ARNDT! There’s plenty of rarely-seen 1940s art treasures—including Lando, The Flame, Green Falcon, and mysterious, never-published art of an alternate version of DC’s Tarantula! Plus more of AMY KISTE NYBERG’s Seal of Approval expose on the Comic Code—and artist SAL AMENDOLA tells the story of ACBA (Academy of Comic Book Arts), the 1970s comics-pro organization, with plenty of photos and art! Extra: FCA (Fawcett Collectors of America), MICHAEL T. GILBERT lurking in Mr. Monster’s Comic Crypt, BILL SCHELLY, and more! Edited by ROY THOMAS. This issue will be in stores Wednesday, May 21, and is now shipping directly from TwoMorrows. This entry was posted in TNT on 14 May 2014 by Mr. Morrow.